We would like to first wish our readers a very happy and joyful holiday. 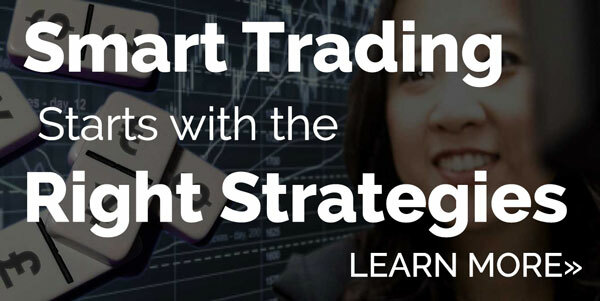 This is a shortened trading week in many markets around the world. The U.S. markets will close early at 1pm ET on Monday and remain closed for Tuesday. In other parts of the world some markets will also be closed for Boxing Day on Wednesday. As a result, there’s very little economic data scheduled for release this week. 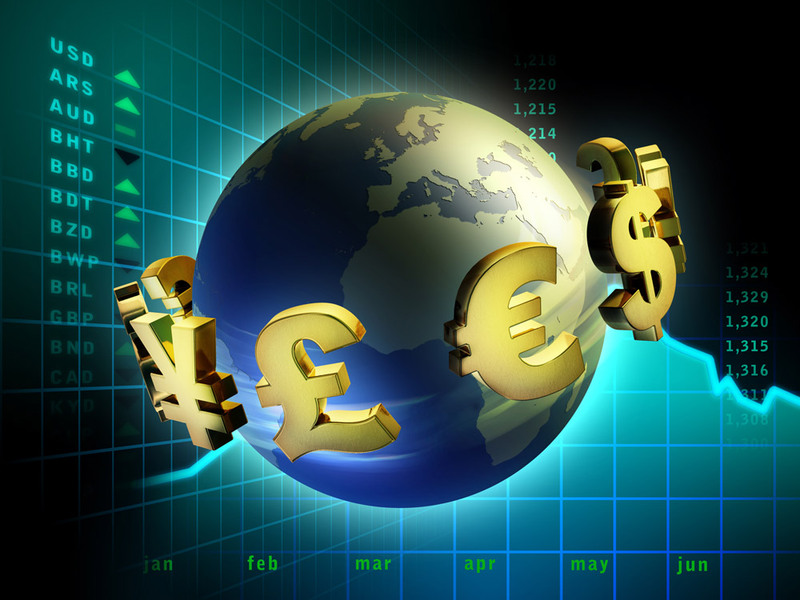 Liquidity will be extremely thin and we believe that currencies will consolidate Monday to Wednesday. However come Thursday, volatility could pick up as traders return to their desks. While most investors would have liked to take the entire week off, the December 31st Fiscal Cliff deadline makes anyone with a position nervous. On Friday afternoon after the market close, President Obama urged Congress to cool off over the holiday and returned with a renewed focus to pass a stripped down package that will act as a stopgap measure to avoid the Fiscal Cliff and buy the government more time to work on a broader plan to rein in the deficit and boost growth next year. This package would involve extending tax cuts for the 98% of Americans earning less than $250,000 and keep benefits flowing for the jobless. Unfortunately with only 8 more days to go before the end of the year, Democrats and Republicans are still miles apart. While President Obama believes that it can be done, the House is not back until the 27th, leaving very little time for an agreement to be made. 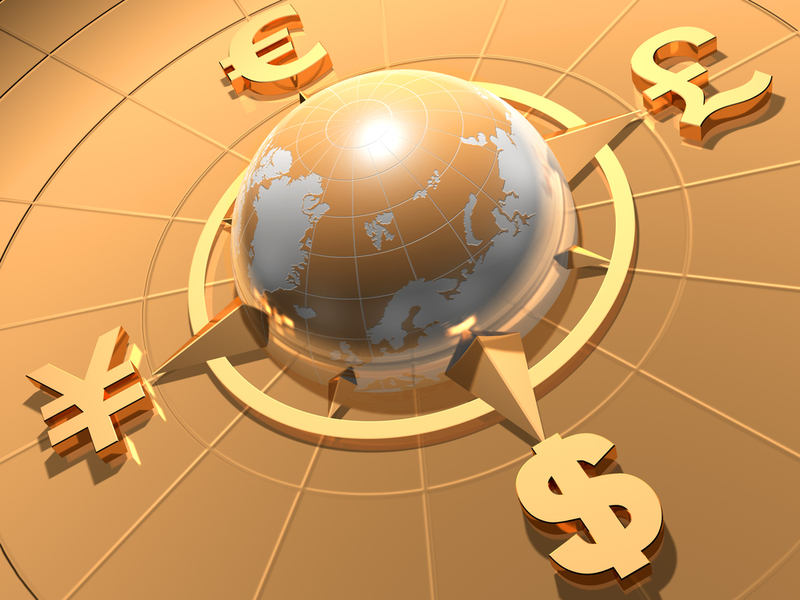 As FX traders, what we care the most about is how the Fiscal Cliff could impact currencies. 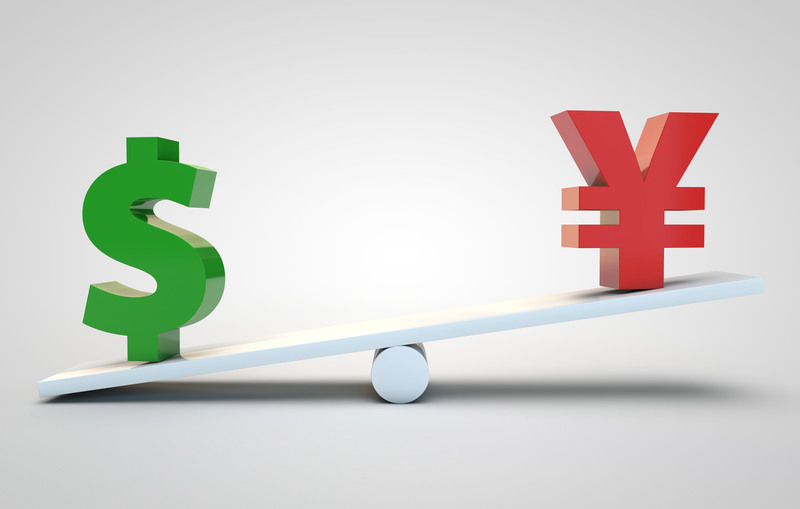 As we have seen in the price action over the past month, optimism that a deal will be reached is positive for risk currencies such as EUR, AUD, NZD and GBP and negative for safe haven currencies like the USD and JPY. Concern about the talks breaking down (like they did on Friday) is positive for the USD and JPY but negative for all risk currencies. However, lets get a bit more specific and discuss 2 potential Fiscal Cliff Forex trades. At this point, most investors realize that the risk of the U.S. falling off the Fiscal Cliff is very real. While President Obama reassuring investors that a deal can be done, members of Congress are acting like children and holding the economy hostage. As a result, there is a very good chance that a deal will not be reached by December 31st and if that’s the case, then a currency pair that you want to be in is USD/CAD. On Friday USD/CAD soared because many investors are buying it to hedge the Fiscal Cliff. More than two-thirds of Canadian exports are destined for the U.S., making Canada’s economy extremely sensitive to the U.S. economy. The gradual recovery in the U.S. economy in the second half of 2012 lent support to Canada and gave the central bank the confidence to openly consider raising interest rates. However if U.S. falls off the cliff and investors become worried about the consequences on the economy, the Canadian dollar could suffer greatly as traders unwind their long Canadian dollar positions. At a time when most central banks are increasing monetary stimulus, the Bank of Canada is the only one talking about raising interest rates. The Fiscal Cliff is the number one concern for central banks around the world and if their concerns materialized, Canada would be among the hardest hit. This fear could lead investors to unwind their long Canadian dollar positions in anticipation of the BoC dropping its hawkish bias. Oil prices also fell 1.5% on Friday and the wider spread between Brent and Western Canada Select oil futures has been negative for the currency. 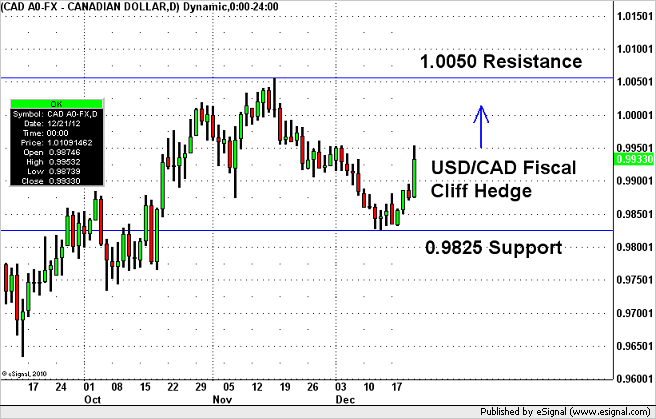 As a result long USD/CAD could be an attractive trade for anyone looking to hedge the Fiscal Cliff over the next week. USD/CAD is also not as volatile as many other currencies so if a deal is reached, the currency pair should not reverse as aggressively, giving investors an opportunity to exit the trade. Even if a scaled back deal is made, it may not satisfy investors and there’s also the possibility of Congress dragging their feet and reaching a deal in early January. Falling off the cliff for a few weeks won’t be the end of the world because the actual tax costs for Americans would be small, but currencies and equities could still extend their losses next week due to uncertainty and remain weak until there are signs of progress. 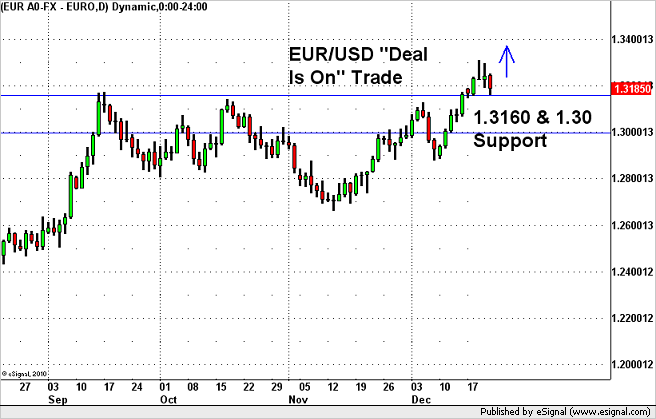 If the Fiscal Cliff deal is a go and investors are satisfied with the outcome, we believe that the currency pair that will benefit the most will be the EUR/USD. On Friday, EUR/USD held up extremely well compared to the other major currencies. As a risk currency, EUR/USD should rally on any positive sentiment but a brighter outlook for Europe could compound gains. With the DAX barely falling on Friday and hovering near its 5 year highs, investors are optimistic about Europe. 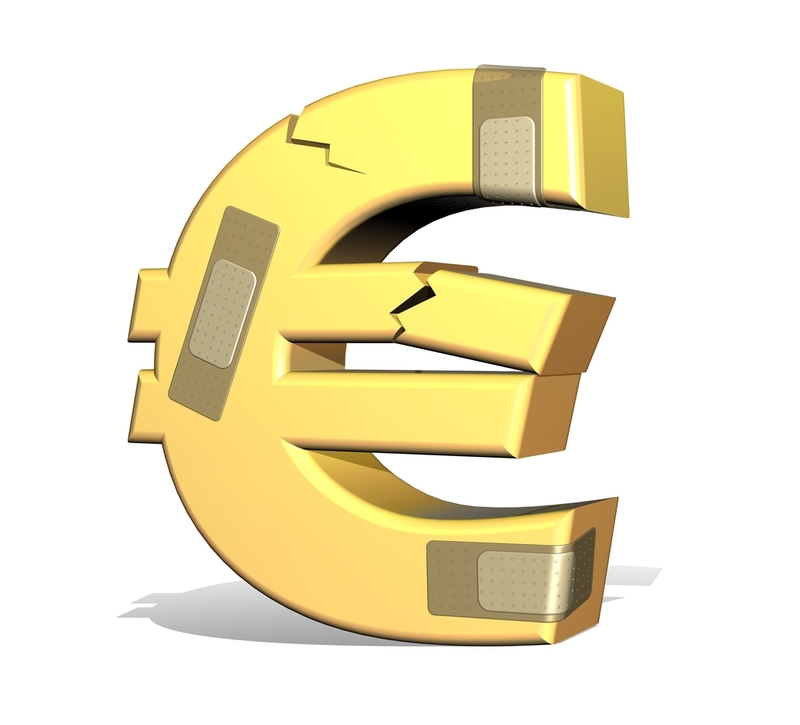 Thanks to the efforts by the ECB and the EU, the sovereign debt crisis is in the rear view mirror. European bond yields have held steady with Spanish 10 year yields at 5.2% and Italian yields at 4.45%. Investors are relieved that Europe is no longer the hotbed of uncertainty. This improvement in the financial markets should drive investment funds back into Europe over the coming year, especially if the risk of the Fiscal Cliff is lifted. happy holidays to you and all…thanks for the comments and easy access to your notes…the changes made to the cnbc website are the pits!!! terrible!!! i can’t find a way to send my opinion to cnbc…if possible please relay my thoughts to the powers that be…in the meantime, keep up the great work and comments!! !